You've seen the chart on the top of the page before. 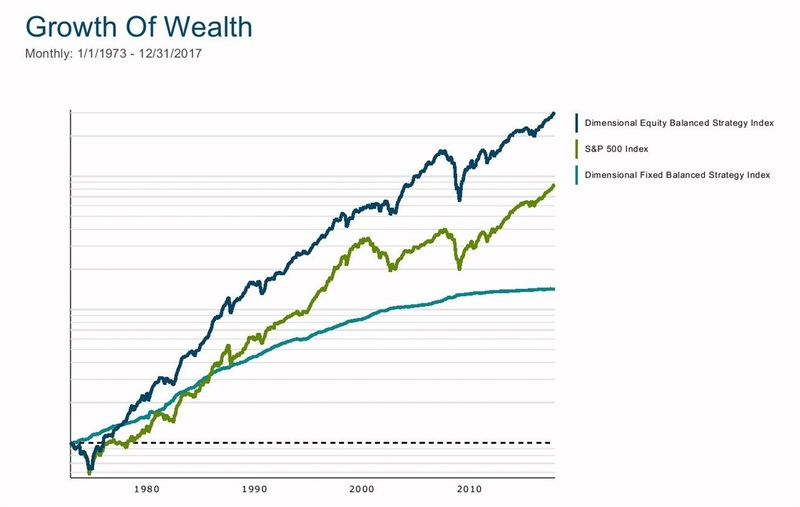 It says quite simply that stocks have outperformed bonds (DFA Fixed Balanced Strategy Index) and globally diversified portfolios that include smaller and more value-oriented stocks (DFA Equity Balanced Strategy Index) have outperformed the market (S&P 500 Index). But for planning purposes, which is where knowledge and implementation intersect, these charts are meaningless. We need data and we need to be able to apply it to our own unique financial situations. Have you ever taken the time to look at year-over-year returns on stocks and bonds in the "modern era" (since 1973)? How many of your misconceptions about investing would change if you did? Would you better appreciate stock investing? $1 in the S&P 500 has grown to over $80, and $300 in the small/value tilted "Diversified Stock Index" (DFA Equity Balanced Strategy Index). That's an amazing accretion of wealth in just one generation. The risk of stocks is evident, but they aren't extreme. If we include 2002, the Diversified Stock Index has seen five years of double-digit declines (six for the S&P 500), and two single-digit declines (three for the S&P 500). 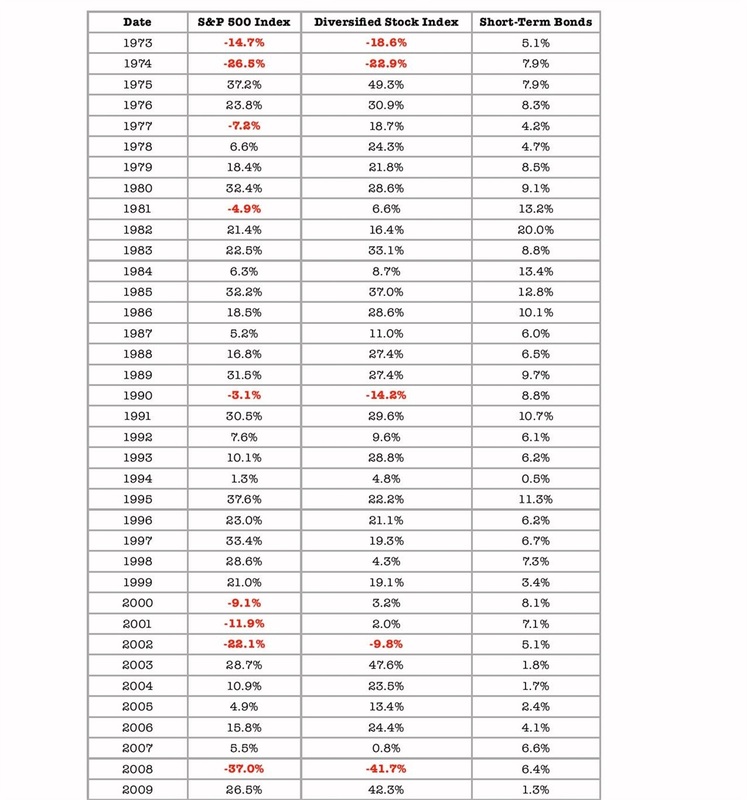 Only one of the bear markets for the Diversified Stock Index lasted longer than one year -- 1973-1974 was two years. There wasn't a single year where the Diversified Stock Index declined but short-term bonds didn't appreciate; there wasn't a single year since 1973 that saw short-term bonds lose value. Despite minimal gains above inflation, short-term bond returns were positive in 100% of years. How would your approach to investing in retirement change? Would you still put 40%, 50%, 60%, or even 70% of your portfolio in bonds because of the fear of losing too much money? Or would it seem more sensible to have two or three years of your income in short-term bonds that you could sell and spend during the unpredictable but inevitable stock bear markets? Or if you were really cautious, maybe five years? Would you worry so much about what stocks were going to do over the next few months or next few quarters, or would you better appreciate that the long-term trend is up and short-term movements are noisy and random? I don't know how you would answer these questions or what you would make of these perspectives. But I believe knowing is half the battle.